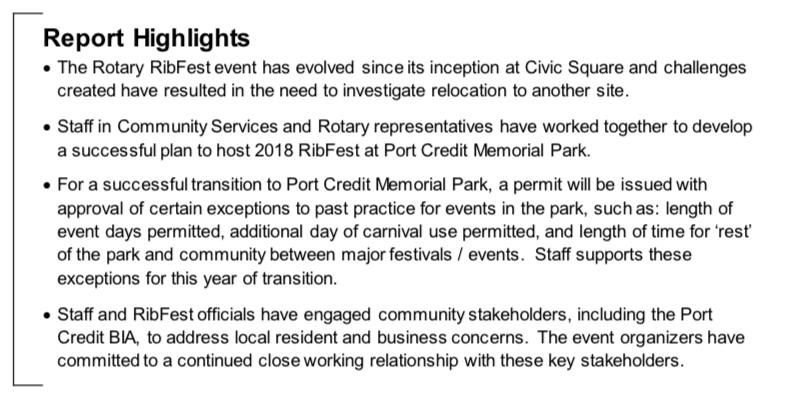 Tomorrow (March 7th…we just heard) City Council will be receiving a staff report (item 10.4 on the linked Council Agenda) regarding a proposal to move the 2018 Rotary RibFest from Celebration Square to Port Credit Memorial Park. The event would run Thursday, July 12th through Sunday, July 15th. The Town of Port Credit Association (TOPCA) is soliciting comments via social media on their FaceBook page and Twitter. For those not on either platform, you may email your comments to TOPCA. If you would like to copy us (portcredit@portcredit.ca) we’ll post them publicly here. Or leave a comment below!